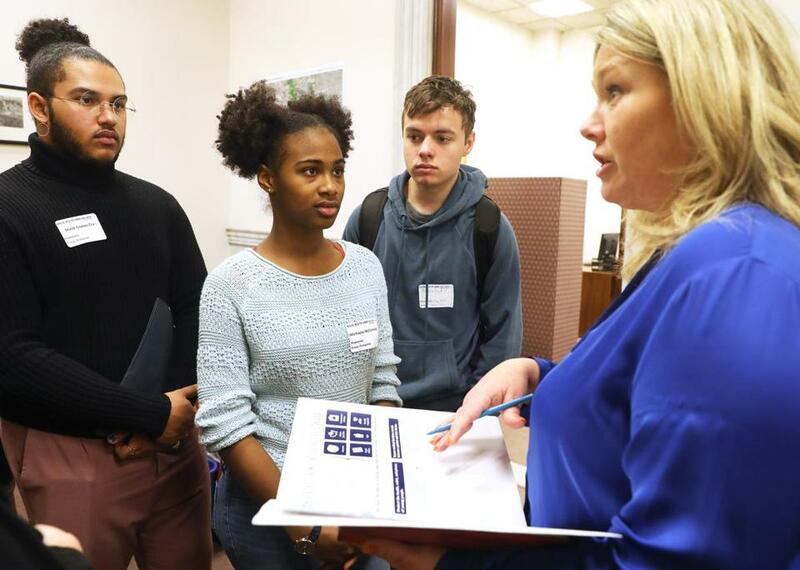 Mary Jordan-Roy, chief of staff for Representative James M. Murphy, met with various students, including Michaela McCormack, 18, (second from left), at the State House on Sexual Health Lobby Day earlier this month. Reproductive rights advocates in Massachusetts and across the country are launching aggressive campaigns for the new year to bolster access to abortion services in left-leaning states, in anticipation of further restrictions in conservative ones. The effort is part of a nationwide strategy by groups, including Planned Parenthood, the American Civil Liberties Union, and NARAL Pro-Choice Massachusetts, to create safe havens for women seeking abortion services at a time when a newly conservative Supreme Court could overturn the 46-year-old Roe v. Wade ruling that made abortion legal. Roe’s determination that the right to an abortion is protected, with some restrictions, under the 14th Amendment’s right to privacy, is all that is stopping some states from banning abortion or further limiting the time span in which a pregnant woman can get one. No longer counting on Roe as a backstop, activists in more liberal states such as New York, Massachusetts, and Rhode Island aim to affirmatively declare abortion legal within their borders and lift vestigial laws that could be interpreted to restrict access in the absence of Roe. “I lived the first three and a half decades of my life without Roe. And let me tell you something: Life is sure better after 1973,” state Senator Harriette L. Chandler told hundreds of reproductive rights advocates who gathered at the Massachusetts State House earlier this month to begin lobbying for greater abortion access. Chandler has introduced a bill with that goal. The Planned Parenthood Action Fund expects over half the states to push for policies protecting and expanding access to reproductive care or expanding birth-control access as the Trump administration tries to curtail both. New Mexico advocates want to repeal a state law, unenforceable after Roe, that criminalizes abortion and punishes doctors who perform it, and Virginians hope to repeal laws requiring vaginal ultrasounds and mandating that second-trimester abortions be done in hospitals. New York marked the 46th anniversary of Roe v. Wade last week by enacting the Reproductive Health Act, which abolishes an unenforced pre-Roe state law that made abortion a crime unless the mother’s life was at risk. It also legalizes abortion after 24 weeks if the woman’s health or the fetus’s life is compromised. Rhode Island lawmakers introduced a bill by the same name that would enshrine abortion rights in state law and lift restrictions that remain on the books, including one requiring a husband’s notification. The effort spurred an anti-abortion protest at the State House on last week’s anniversary of Roe and the introduction of a competing, much more limited bill. If Roe were overturned, 16 states could take steps to ban abortion. Four have laws that would trigger bans if Roe is toppled, while 12 others have anti-abortion laws on the books that have been ruled unconstitutional by courts or have not been enforced under Roe, according to the Guttmacher Institute, a research organization that supports reproductive rights. Absent the constitutional protections of Roe, activists could seek to relitigate or revive those laws. Massachusetts is one of nine states where abortion rights are protected by interpretations of the state Constitution, as well as the federal one. But even in such states, laws restrict when and how women can get an abortion. In Massachusetts, anyone younger than 18 needs to show she has the consent of a parent or judge, and no one can get an abortion after 24 weeks unless her health is in danger. Chandler’s bill — called “An Act to Remove Obstacles to Expand Abortion Access,” or ROE Act — would allow for later abortions in cases of fatal fetal anomalies. It would also remove the age and parental or judicial consent requirements for abortions. It remains to be seen how Massachusetts, a left-leaning state with considerable Catholic influence, will react. A similar proposal fell flat during the 2002 governor’s race when Democrat Shannon O’Brien called for removing consent requirements for women as young as 16. Bills have been introduced in the Legislature to lower or remove the age requirement but have not moved out of committee. Anne Fox, president of Massachusetts Citizens for Life, said the public is not willing to surrender parental rights on something as critical to a young person’s life as abortion. For years, Fox said, abortion rights advocates have been trying to lower the legal age for abortion to 16. “It hasn’t gone anywhere because a normal person says for a 16-, 14-, 12-year-old, the parents have responsibility for these children,” Fox said. But advocates in Massachusetts and other states are seizing upon the backlash to the Trump administration to try to advance such measures. Massachusetts already took steps last summer to reverse old, unenforced laws on abortion and other women’s health issues, decriminalizing abortion and eliminating an unenforced provision that barred a doctor from prescribing contraceptives to an unmarried woman. Still remaining in Massachusetts, though, is a 1974 state law enacted in the wake of the Roe ruling that aimed to limit abortion as much as possible. Cosponsored in the House by William Delahunt of Quincy, who would later become a congressman, and Raymond Flynn, who would later become Boston’s mayor, it aims to “protect unborn children” and defines pregnancy as “the condition of a mother carrying an unborn child.” It also calls for a 24-hour waiting period for an abortion (currently not enforced) and requires abortions after 24 weeks to be performed in a hospital — a precaution that’s no longer necessary after the medical advancements of the past four decades, according to Johanna Kaiser, media relations manager for Planned Parenthood League of Massachusetts. Reproductive rights advocates point out that the laws treat abortion differently from other forms of pregnancy-related care, particularly for minors. In Massachusetts, a teenager can get birth control, testing for sexually transmitted infections, and prenatal care or even put a baby up for adoption without parental consent. “Our goal is to align this health care with the policies for all other pregnancy-related care,” said Kaiser. Rhode Island’s abortion law treats minors similarly, while New Hampshire requires minors to notify their parents but does not require securing their consent. Maine allows abortion for minors who undergo counseling. New York and Vermont place no age restrictions on abortion, and Connecticut mandates counseling only for those younger than 16. The push to expand abortion access in Massachusetts comes as many other states aim to rein it in. Last year, both Louisiana and Mississippi enacted laws barring abortion after 15 weeks except in cases of medical emergencies or severe fetal abnormalities. After Mississippi’s lone abortion clinic sued, a federal judge permanently blocked the law, with repercussions in Louisiana as well. Ohio, which has enacted a series of restrictions in recent years, passed a bill banning abortion after a heartbeat can be detected and nearly overrode a veto from the outgoing governor, whose successor has said he would sign it. Iowa enacted a similar heartbeat law that was struck down as unconstitutional last week . Voters in both Alabama and West Virginia approved constitutional amendments saying abortion is not a protected right under their state constitutions — changes that could pave the way for efforts to defund or outlaw abortion if Roe is reversed. Massachusetts anti-abortion activists had petitioned unsuccessfully for a similar measure in 2017 as an initial step toward blocking state funding for abortion.